Back from vacation! Woo hoo! One of my habits when watching TV or movies is thinking about the production of the show. Where are they filming, how are the sets laid out, etc. I particularly like trying to find clues if they are filming on location or on a backlot. Some TV series, like Supernatural, often film on location with real places filling in for places in the story, which is a cheap way to get a realistic visual feel. Others, with bigger budgets and visions like movies will use a backlot to film on. Some backlots are nothing more than empty wilderness and others are complete sets of buildings on a street like the above image but its all fake. I like trying to figure out if an outdoor city scene is a location or a backlot in a show by looking for clues that not all is as it seems. Is the street lacking potholes and defects? Are the lamp poles too devoid of endless flyers? Are the sidewalks even and facades unblemished? There is an unlived look to backlot city scenes, a pristine-ness that real cities never have or cannot maintain. They're scuffed, worn, dirty, damaged, repaired, replaced, recycled. They're real. I have a point, really I do. Playing in EVE often feels like living on a backlot would be as opposed to living in a real city. There are buildings but there's nobody home; there are actors but no people. In EVE, there are stations and empires and NPC ships, but it all feels like empty buildings and actors as opposed to thriving civilizations of people. One of the biggest contributors to this empty feeling has been the inability of NPCs to shoot each other. Such a simple thing that one would think would be easy to have in a game but in EVE's legacy code NPC ships were restricted to only target players. Thus a cluster of solar systems with empires and pirate factions constantly at each other's throats was represented solely through lore stories and videos (like the start of faction war between the empires with the Empyrean Age downtime), the occasional scripted missions ("Oh no, a ship blew up! It must have been the enemy, we need you to get revenge! "), or even more rare live events where CCP actors get dressed up in lore characters and drive the narrative. And that's what makes the recent events between the Drifters and the Amarr Empire so interesting. Here, for the first time, we have honest to goodness NPC on NPC action (oh my!). 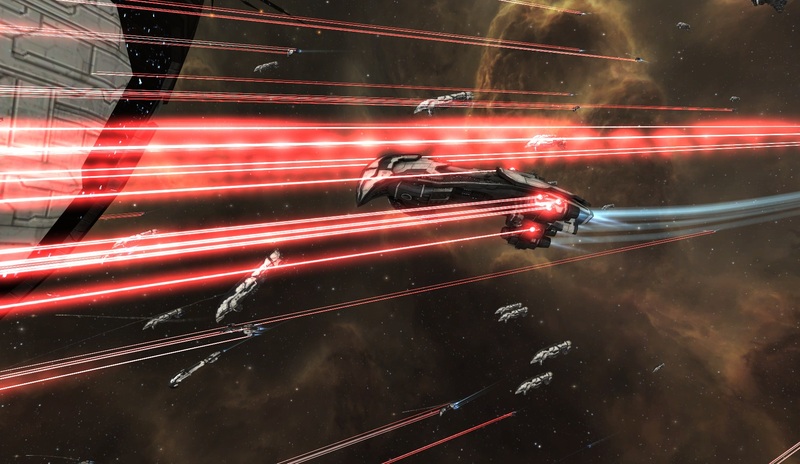 Imperial ships firing on Drifters and vice versa represents a turning point in the backlot of EVE Online. It is now feasible for players to get caught up in the machinations and wars of the empires as opposed to only hearing about them tangentially. Imagine, a mission assigned to you where you are a small part of a larger fleet engaging an enemy fleet, everyone but you NPCs. Or exploration sites where Navies fight against pirate forces and players can join in on one side or the other. Incursions where the empires actually try to fight off the hostile forces. The EVE universe still feels like a backlot, but at least it feels a little more real to me now.